Hi everyone, it's mes, Carmine. Mes heard the Mom told yous mes wasn't feeling very good yesterday. It's true. Mes hasn't been feeling very good latelys. Mes has been very sniffly and sneezy and mes has had watery eyes. When mes sleeps on the Mom's pillow with hers, mes sneezes on hers many times at night. Hers usually wakes up and pets mes and says, "Poor Carmine." It is hard for us to get to see our regular vet man when wes is sick, so the Mom ended up taking mes to a Banfiled place instead. The vet lady there was very nice and felt bad for mes. Hers gived me something called Doxycycline to make mes feel better. BUT all theys had was a horrible-tasting one,!! The Mom and the vet lady didn't want to wait until theys could getted the medicine to tastes good for mes to start taking it so mes had to take the YUCKY medicine all weekend!! Mes was very unhappy about that! The Mom wented to get me the good medicine last night, and it sure does taste better, AND mes doesn't need as much of it to get the same benefit. The vet lady was good. Hers did not want to set off mes pancreatitis, so hers and the Mom decided not to give mes Clavamox yet - not unless the doxycycline doesn't work 'cause it really, really upsets my tummy. Mes is still very congested and sneezy. The Mom talked to the vet lady last night, and hers said it might take a whiles for the congestion to go aways. Mes and the Mom is hoping it doesn't take too long 'cause mes doesn't like this not feeling goods. The vet lady said hers hearded a little stuffs in my lungs, so wes is hoping to keep my "upper respiratory infection" from becoming "pneumonia." Litas told mes about pneumonia, and it sure did NOT look like a good time!! So if yous can find a spare purr or prayer to send my way, mes would sure appreciate it! Mes hopes all our friends are doing well and staying warms! 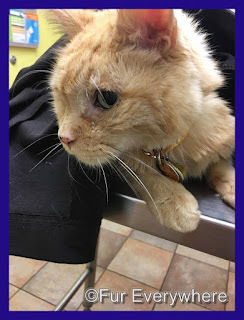 We are sending tons of purrs and prayers to you sweet Carmine and we sure hope you start feeling better super soon. Poor Carmine! We send you a ton of purrs and hope you are feeling better real soon. Oh, Carmine, I Pipo am purring hard for you to get better quickly. And pawyering for that not to become pneumonia. Sorry you don't feel well Carmine. We're sendin' lots of hugs and purrayers your way. I'm sending lots of purrs your way, Carmine - I hope you are feeling better soon! sending tons of purrs and prayers and hoping you are feeling like yourself soon! Sending healing thoughts. I hope you are feeling better quickly. Meow meow Carmine mee mew frend mee will purray fore you...mee will ask CatGod Above to help you feel bettur an get well soon. LadyMew iss all so purrayin an shee even cried reedin yore post. Shee iss furry worried 'bout you.....wee all are! Dear Carmine, we are sending purrayers and POTP to you and all your caretakers so you can get better. It is good that your medicine tastes better, at least.